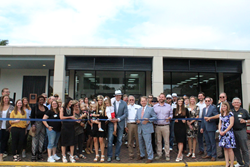 Last week, Elliott Homes opened its new Design Studio on 1402 Pass Road with two days of celebrations. In an official ribbon-cutting ceremony Wednesday afternoon, Gulfport Mayor Billy Hewes praised Elliott Homes for setting the standard in quality both in its new location and coastal homebuilding. “We created our Design Studio to allow customers to personalize their homes just as they want them to be,” said Jeanne Hanish, Design Studio Specialist. Two-day festivities celebrate community and trade partnerships. Last week, Elliott Homes opened its new Design Studio on 1402 Pass Road with two days of celebrations. In an official ribbon-cutting ceremony Wednesday afternoon, Gulfport Mayor Billy Hewes praised Elliott Homes for setting the standard in quality both in its new location and coastal homebuilding. Immediately following, more than 40 invitees enjoyed a cocktail reception at the new studio—also home to Elliott Homes’ new corporate offices. Inspired by movies such as Oceans 11 and The Thomas Crown Affair, “The Break-In Bash” paid homage to the site’s former resident, Hancock Bank and was the official “breaking in” of the new location. Team members wore 1930s-inspired costumes to celebrate and served delicious hot hors d'oeuvres and cocktails including a champagne fountain. On Thursday, Elliott Homes invited area Realtors and trade partners to the sequel “The Big Break,” a similarly themed event which drew over 30 area Realtors. Preserving the vault, safe, and teller stations, Elliott Homes integrated them to create a modern and welcoming space. Officials such as Gulfport Public Information Officer Chris Vignes, Councilman Ron Roland, Councilwoman Ella Holmes-Hines, and members of the Gulfport Chamber of Commerce, toured the Design Studio and viewed its hands-on selection of elegant cabinets, lighting fixtures, flooring, hardware, and tile. Brandon Elliott, President – Elliott Homes, expressed his gratitude for community support in transforming Hancock Bank into its new site—and in helping Elliott Homes’ fulfill its ultimate mission to improve people’s quality of life through the homes it builds. Elliott Homes, one of the Mississippi Gulf Coast’s most sought-after home builders, specializes in distinctive award-winning homes and master-planned communities. What distinguishes Elliott Homes is our exceptional customer service. Our professionals, many of them Elliott Homeowners themselves, are passionate about ensuring a seamless and rewarding home building process. At Elliott Homes, we believe home design is more than a blueprint—it’s about realizing the lifestyle our customers dream about. Unlike other builders, Elliott Homes start in the low $200s and include impressive upgrades standard. For more information, please visit https://www.myelliotthome.com/.